Rarely performed but recognized as a hidden masterpiece, Sibelius’s score for Jedermann is unusual in that the music closely follows the words and action of this morality play, intensifying Everyman’s hubris, penance, escape from the Devil’s clutches and ultimate salvation. 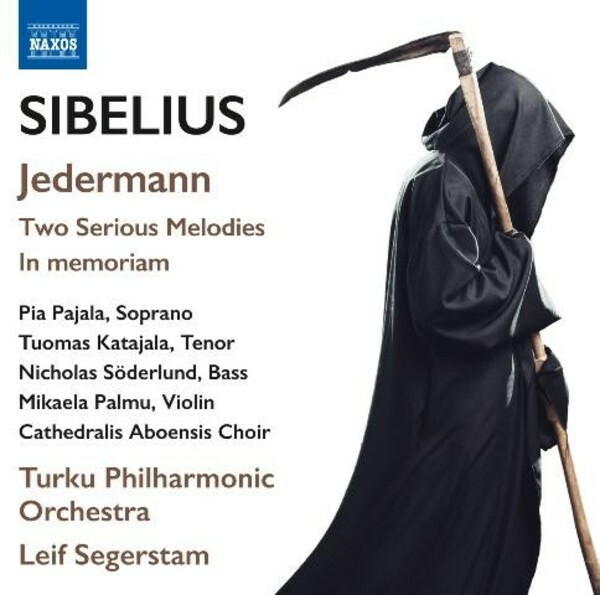 The Two Serious Melodies reflect Sibelius’ dark mood during the difficult years of World War I, while In memoriam resonates with his preoccupation with death in 1909 following a life-saving throat operation, and was performed at his own funeral in 1957. This is the fourth of a six volume set that explores Jean Sibelius’s orchestral works beyond the higher profile symphonies, violin concerto and tone poems. Finnish conductor Leif Segerstam is an acclaimed Sibelius interpreter, having been awarded the annual Finnish State Prize for Music in 2004, and in 2005 the highly esteemed Sibelius Medal. In this fourth volume, platinum record-making and award winning orchestra, the Turku Philharmonic, accompanies a world class team of vocal soloists in Pia Pajala, Nicholas Söderlund and Tuomas Katajala, as well as the Cathedralis Aboensis Choir, which has a close association with the Turku Philharmonic Orchestra.